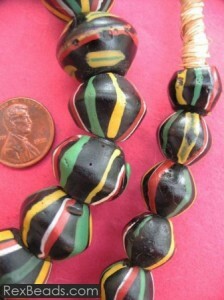 King beads are old Venetian wound and marvered bicone beads. There is a legend behind the naming of these beads which holds that these beads were worn by African Kings and tribal chiefs during the mass importation of African trade beads in the early 1970s. The earliest versions of King beads are dated to the mid 19th century, with their representations having been made on bead sample cards donated by Moses Lewin Levin to the British Museum in 1865. King beads still hold a place of importance in modern African society where they are prominently featured in Dipo Initiation ceremonies held in Ghana, with the yellow King beads being used to symbolize maturity and prosperity. King beads are today available in a wide range of attractive colors, sizes and designs – but always in the bicone shape.